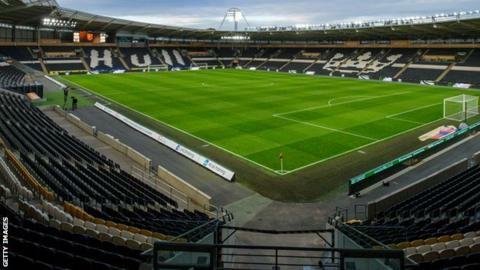 Hull City Supporters' Trust and a UK/US consortium are preparing a £45m bid for the Championship club. The consortium is made up of investors in the sports crowd micro-financing business SportyCo. SportyCo chief executive Marko Filej has met with the club's owners, the Allam family, and a letter has been sent to the club to start negotiations. The Tigers are bottom of the second tier with eight points from their opening 12 matches of the campaign. Geoff Bielby, chairman of the Hull City Supporters' Trust said: "We are 100% sure that this new and unique approach of combining institutional investors and the fan base will enable us both to achieve our goals, a successful and stable Hull City AFC that will be a joy to watch play." SportyCo, a company which uses blockchain technology to allow people to invest in sportspeople and institutions, sponsors Spanish top-flight side Espanyol. The Allam family has been looking to sell the Tigers since 2014 and fans have protested against their ownership on a number of occasions. Former Tigers chairman Paul Duffen is leading another consortium looking to buy the club.